I'll tell you what, for me not being a "hat person" I have sure been having fun making and designing some new bun hats lately! I've enjoyed looking through my stash and working on color combinations. I've been inspired by special requests from customers, and have had my imagination sparked by new yarn purchases. I've come up with updates for previous designs, and fun ideas for new patterns. It's going to be a season of bun hats here on Haute Kippy! After some unforeseen circumstances occurred this summer, I ended up having to take an unwanted hiatus from working on crochet, the blog and pattern development in general. 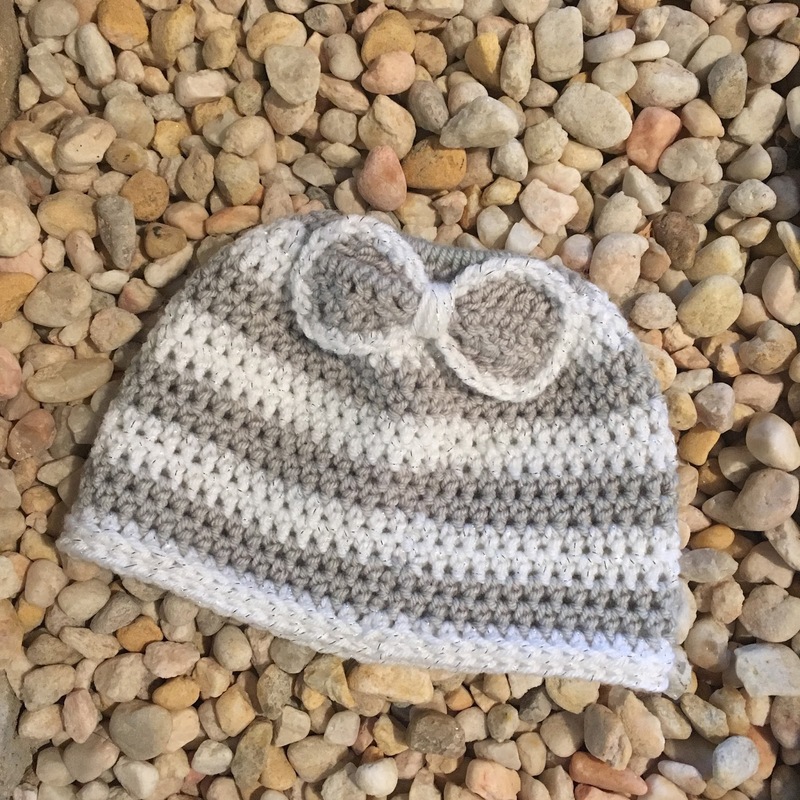 I had set a goal for myself as a new blogger to publish two new patterns a month over the summer, and when crochet season starts up again (i.e. now) I would up the ante to four new patterns a month, one for each week. Unfortunately for me, the things that happened late this summer prevented me from meeting that new goal. So I'm starting fresh this month and keeping my goal at two new patterns per month. Yay for you! We're taking baby steps here on the homefront and until the situations allow, we will just be grateful for God's grace and mercy and take each day, week and month as it comes. I've since been blessed with my first craft/vendor show opportunity- a long standing prayer faithfully answered! Once I got back to work, I couldn't stop making items to stock my craft table. I'm so excited finally show my wares and make real sales! Another exciting development is the announcement of my upcoming mini-eBook! I have just been blown away at the response to the Gina Messy Bun Hat in its first months online the free pattern racked up over 12,000 pageviews and it has been by far my best selling PDF download. I launched the idea for my mini-eBook giveaway as a means to boost Gina to 20,000 pageviews. A lofty goal I know, but one I believe can be achieved. 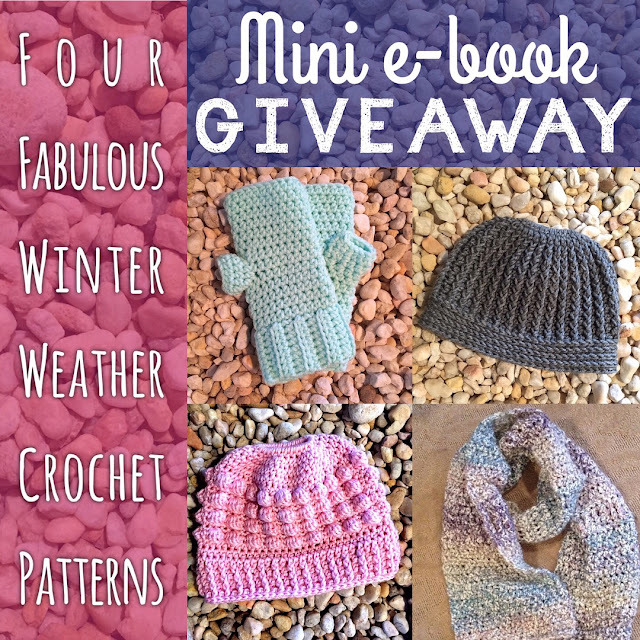 Once Gina hits 20K, I will choose 10 winners who have shared the contest post on social media to receive a free copy of my new mini-eBook, featuring the Gina, and other popular winter weather crochet patterns from my design cache. After the contest, the mini-eBook will be available for sale on Ravelry, Etsy, and most excitingly- will be published to Amazon! Keep an eye out on social media and be sure to follow Haute Kippy on Facebook, Instagram and Pinterest to participate! 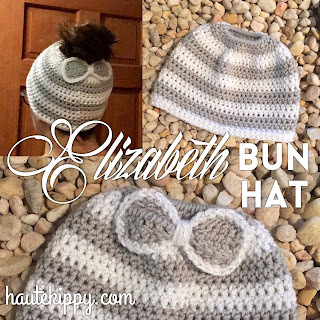 Want more fun bun hats? My friends at allfreecrochet.com have plenty to share! 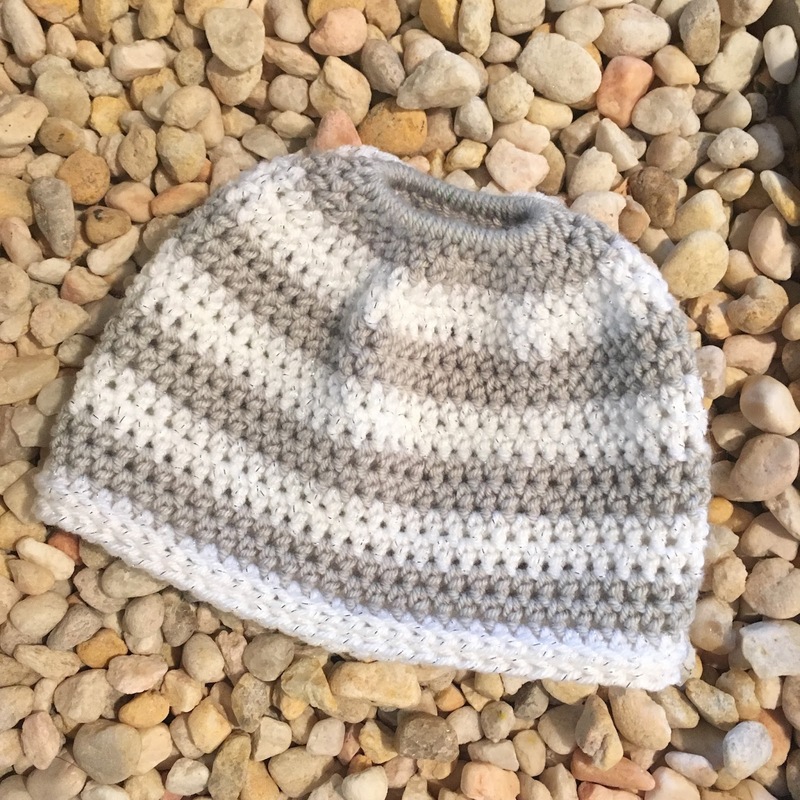 I love free patterns, and All Free Crochet has thousands. 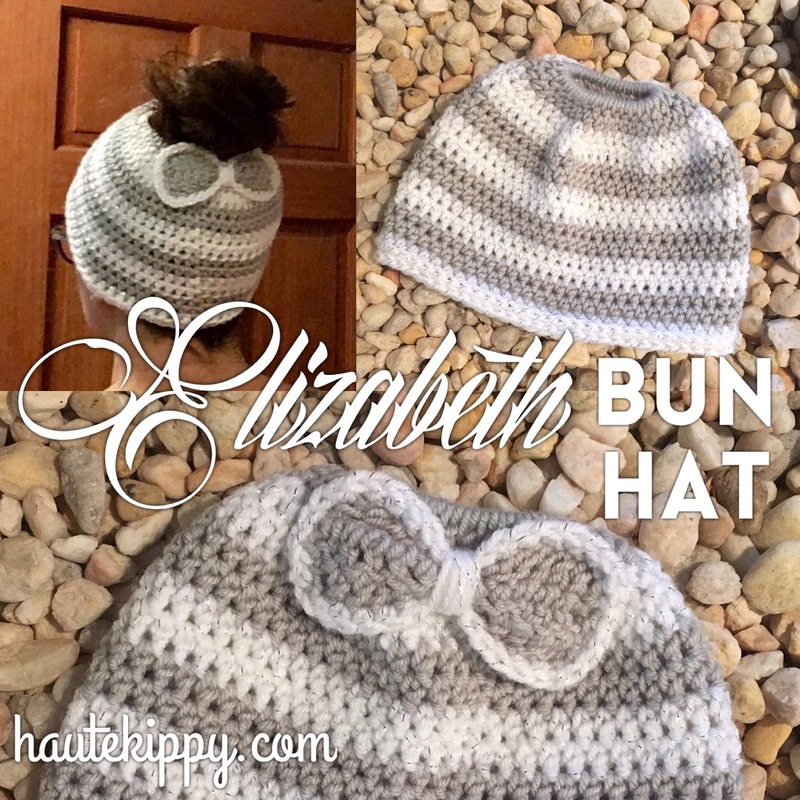 There are individual patterns to browse as well as fabulous bun hat pattern collections. You'll find a bun hat to suit your every need! 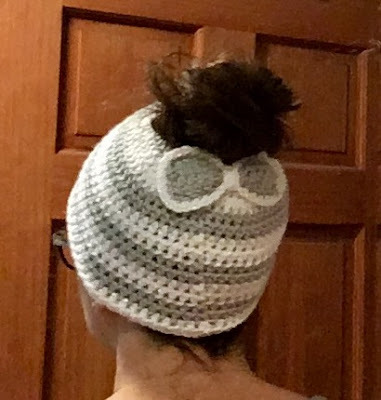 So here's my latest bun hat, and one of my first yarn-specific patterns. I have been designing things that can be made out of any old worsted weight yarn. But I've been focusing on colorwork lately and the patterns you'll see coming forward will likely call for very specific yarns in certain colors in order to get the look shown. I often mix yarn brands so if you're a purist, be forewarned! I shop at the big four, (Hobby Lobby, AC Moore, Michaels and JoAn) and very often use store brands such as Nicole, and ILTY. I may mix brands but I won't mix words! A printer friendly PDF download is available in my Ravelry shop. Click the buy now button! Also available on Etsy! stitch in third loop- make stitch in the horizontal bar located on the wrong side of the hdc, directly below the “v”. Notes: Make first stitch of round in same stitch as join throughout pattern. Ch 1 at beginning of round does not count as stitch. Carry both yarns along inside of hat, picking up and dropping colors as indicated. Round 6: hdc in each st around, join, ch 1. Round 7: pick up white, hdc in each st around, join, ch 1. Round 8: hdc in each st around, join, ch 1. Rounds 9-12: repeat rounds 5-8. Round 15: pick up white, hdc in each st around, join ch 1. Rounds 16: sc in the third loop of each st around, join, ch 1. Round 17: loosely sl st in each st around, join, fo. Row 2: dc in first four sts, hdc, sc, sc, hdc, dc in last four sts, ch 2, turn. Row 3: dc in first four sts, hdc, sc, sc, hdc, dc in last four sts, then ch 1, Drop graymist, pick up white, pivot bow to work along raw edge, sc evenly across making 2 sc in the end of each dc across (i.e. 6 sc along raw edge), ch 1, pivot work, sc in each st across, ch 1, pivot work, sc evenly across raw edge as before, ch 1, pivot work, sc in each st across, ch 1, join at corner. (Invisible join looks best) FO, weave in ends. Thread yarn needle with a length of white and wrap yarn around center of bow, when wrapped, sew back and forth on wrong side of bow to secure yarn tail. Thread needle with coordinating yarn and sew bow onto center back of hat below bun opening. Weave in all ends.